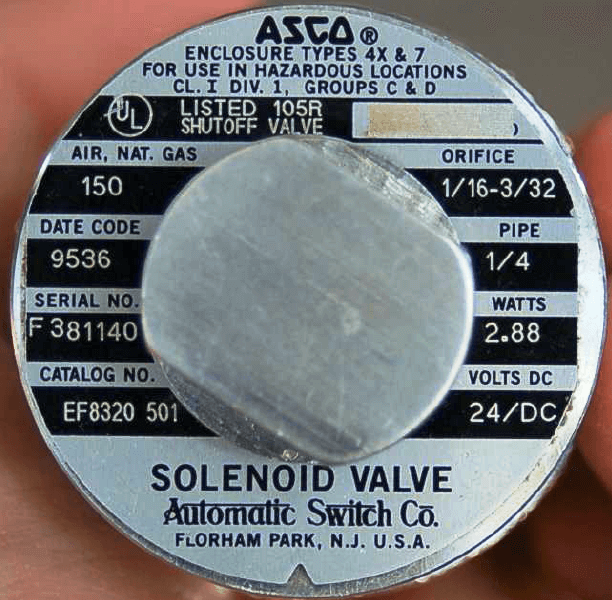 Home » What is a 3-way Solenoid Valve ? 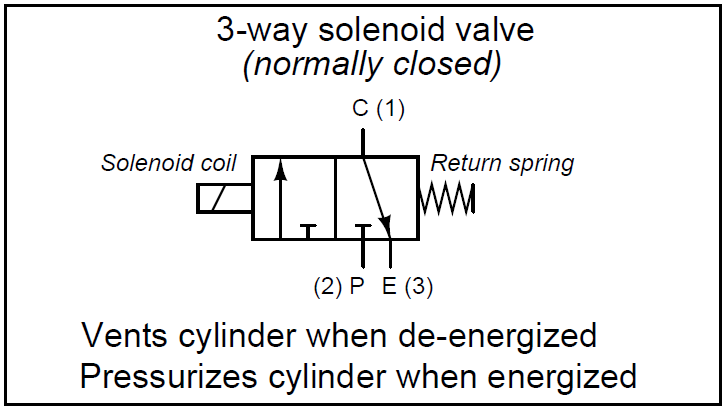 3-way solenoid valves operate in a manner analogous to single-pole double-throw (SPDT) electrical switches: with two paths for flow sharing one common terminal. 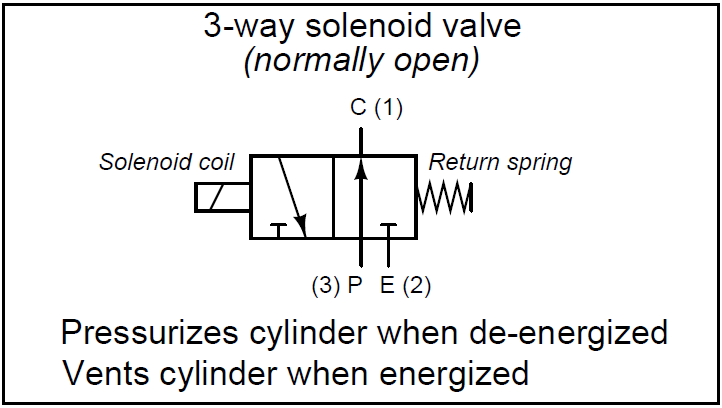 3-way solenoid valves have three ports for fluid, and like 2-way valves may be referred to either as normally-open and normally-closed. Ports on a pneumatic 3-way valve are commonly labeled with the letters “P,” “E,” and “C,” representing Pressure (compressed air supply), Exhaust (vent to atmosphere), and Cylinder (the actuating mechanism), respectively. The letters used to label ports on a valve such as this not only denote those ports’ destinations, but also serve to mark which “box” of the valve’s symbol is the normal (resting) state. In all fluid power diagrams you will see that only one of the boxes on each spool valve will have lines connecting to it and/or labels at the fluid ports, and that box is the one which will be aligned when the valve is not being actuated. Alternatively, the numbers 1, 2, and 3 may be used to label the same ports. However, the numbers do not consistently refer to pressure source (P) and exhaust (E) ports, but rather to the 3-way valve’s “normal” versus “actuated” statuses. A 3-way valve will pass fluid between ports 1 and 3 in its “normal” (resting) state, and pass fluid between ports 1 and 2 in its energized state. Another way to think of this labeling is to consider port 1 the common, port 2 the normally-closed, and port 3 the normally-open, in a manner similar to SPDT (form-C) electrical switches. Again, bear in mind that the words “open” and “closed” do not mean the same for fluid valves as they do for electrical switches. A “normally-open” port on the valve permits fluid flow in its “normal” state, whereas a “normally-open” switch contact prevents electric current flow in its “normal” state. As with 2-way solenoid valves, the arrows denote preferred direction of fluid flow. Bidirectional 3-way valves will be drawn with double-headed arrows (pointing both directions). Regrettably, these symbols are not nearly as descriptive as those used in fluid power diagrams. What is Pinch Valve ?